"It's that dog-goned goose!" said Rummage Ira Fulks. " I'll just be damned if you're not into something else! You get out that there! Every time I look, you're into something else! Pointing one finger contemptously at the white bird, Rum loudly exclaimed: " You are absolutely the most useless thing I've ever seen!A man gave you to me, and by-God- I understand the reason now! One of these days I'm gonna chop off your head and throw you into the cooking pot!" Never following up on that threat, a time came that dad sold to a Mr. Kilgore, all his hogs, the chickens, and that goose was given away. As for me, George Fulks, his four-year-old son, the bird did not annoy me at all. It was a thing that caused me to shape my mouth into an "amazed-surprised" look. It was a diversion that lighted my face with smiles and laughter. The goose was a creature that I loved. It would run,honk, and peck at chickens and the dog and cat. It was an expert at snatching food from our chickens and the family pets. I watched that bird chase after butterflies, nip the cat's tail, and awaken the dog from its nap.It would have to be driven out of a flower bed, the dog's house, and even the trunk of Dad's car. 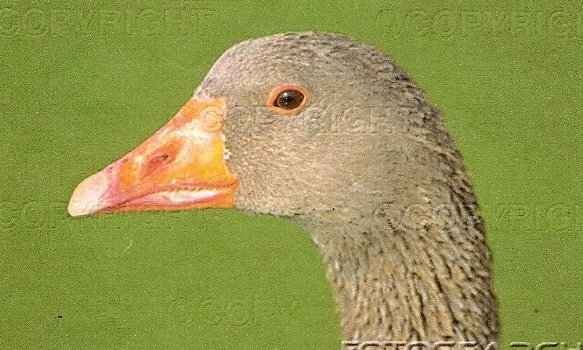 As a four-year-old child, I gained a sense that the goose was a thing that acted so foolishly, I could never have misbehaved as totally. Any mischief I entertained as a child might be forgiven within the maze of its complete uncontrolability. Both my mother and father were continuously into conflict with it. Hardly a day passed that I didn't hear my mother say, "I wish we could get rid of that goose. It just aggravates me to no end." And my dad would exclaim: "it goes from one bit of trouble to another!" If our chickens, and the dog and cat could have spoken, those would surely have shared the same words. My dad's friendship, acquaintenance and working relationship with Rex Holland, manager of Kentucky Woodlands Wildlife Refuge, became the turning-point in the lives of Rummage Ira Fulks and his family. By gaining employment on a wildlife refuge, my dad was able to resign from his job on the nightshift at the Kentucky State Pen in Eddyville, Kentucky. His disposition improved considerably. He began to relax and enjoy life more. On his leisure days, he often participated in his favorite sport- the hunting of bob-white quail. Dad had daylight time and began to pay more attention to his son and four daughters. The nightshift in a shotgun tower of a prison had required that Rummage Fulks sleep through several hours of daylight. 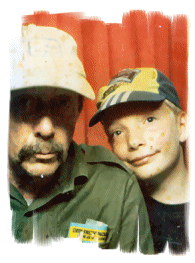 Employed as a security guard at a maximum security prison was a job that my dad did not relish. "That's a job that nobody would have," he said. "I have to force myself to arise and go to work in that. It's a hellhole." Showing some compassion for the goose, the dog, the chickens and the hogs, his bursts of anger was most likely displaced hostility. Dad hated to use the meat from the hogs. To the sow, I once heard him say: "I know it hurts you to see me taking one of your young, but that's the way it is. You're not even a bit beautiful.I wouldn't even have you if it wasn't for the meat you provide us." Such commentary was in response to the fact that the sow showed very clearly that she hated Dad and me. She would charge at both of us and growl in a rage when Dad and I ventured near her fenced-in corral for her watering and feeding. She might have killed or seriously injured both of us if she could have broken through sturdy wire fencing that impounded her and twelve or more piglets. She would make her best effort to penetrate through that barrier. Appearing on my dad's face was a sense of relief when the time came that all of the hogs were loaded onto Mr. Kilgore's truck and moved to a farm several miles away. "I'll take all your hogs and that goose for $125, Rum." Dad replied: "Consider the goose is for free. You'll love it. You can consider the goose a gift from a friend, Dan." It was a winter there across from a cemetary and less than one mile from the Old Eddyville Ferry that I, as a child, became conscious of the existence of such a thing as snow. Dressing me in a snowsuit, mittens, winter boots and a pullover cap, my mother, Ella and I were cast into an early morning of five below zero and more than twelve inches of that white substance on the ground. It was 1944, and far away was World War II. Carrying me out to a fence abounding our front yard, my mother, Ella Belle Fulks and I , found joy in what the night had done for Kentucky. "It'll be a white Christmas," she said to me. Pulling off one mitten and tossing it on the ground, I touched and picked-up a handful of snow from a fencepost. Holding it for just a few seconds, I suffered my first case of frostbite. Rummage Ira and Ella Belle Fulks provided for themselves and their children plenty of wholesome food. Also well fed were the hogs and family pets. Of course, a goose stole what it needed from the others. Also recollected is that before the end of autumn of that year, Dad brought home a washtub that was filled with honey and honeycomb. Finding a tree occupied by wild-bees, we enjoyed honey into that winter. That Fulks family of four girls and one boy lived more prosperously than many others in the rural areas. Dad was paid $80 monthly as a prison guard. Our clothing was not fancy, contemporary, or the best available,, but it kept us warm. Frigid and snowy were the only words to describe much of the winter of 1944-45. Living in a house that my dad had constructed following The Tennessee Valley Authority's acquisition of the former Henry Jackson Fulks II land,our kitchen was the only warm and comfortable room during frigid weather. Heated by both an iron stove for cooking and a potbelly for when the cookstove had cooled down, the family spent much of their time there in Winter. Worthy of note is that Western Kentucky Summers were not often extreme. High humidities usually dissipated at night, and the forests and creeks provided relief during many humid, summer days. 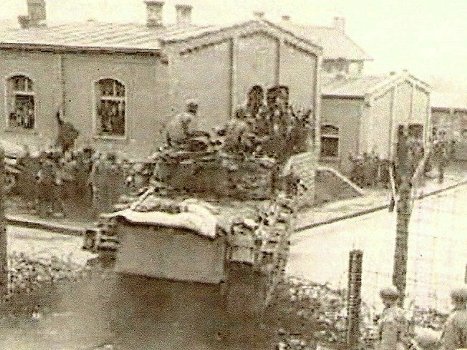 (For use of the above image, appreciation expressed to http://www.thirdreichruins.com/hammelburg14.jpg) From December 7,1941-August,1945 was World War II. "Why are they trying to kill each other?" I recall asking my mother. Listening daily by battery powered radio to news reports of those killed or missing in action, each morning was a stressful time for all of us. Among those soldiers serving in Europe were brothers, uncles, cousins and close friends and acquaintances of the Fulks family. In one instance, a Kenneth Abbott was mentioned on the radio broadcast as "killed in Belgium." It turned out that the Kenneth Abbott killed was not my mother's brother. The man killed was not from Kentucky; but a large city in Ohio. Following The Battle Of The Bulge during what might have been early February, 1945, Cousin & Private Harvey Hubbard came to visit us on furlow. A member of Patton's 3rd Army, his uniform as a private was befitting of the finest of officers. Every button, all his uniform, and his shoes shined as a model from a recruiting poster. First, shaking hands with my dad from over the front gate, Cousin Harvey did not enter our yard or house. Recalling Harvey's conversation, his oratory remains permanently engraved within the memory cells of a child six months away from being five years old.
" Rum, it's good to see you again. I just have to tell you. If you don't believe in miracles, you're looking at one. I've come so close to getting killed that I can't believe I'm standing here alive. They tried in every way they could to kill me, and they nearly did. I just don't know how they could have missed me. I did take a hit from small arms fire that went through the toe of one boot. It ruined my boot, but didn't break the skin. I took a boot my size off a dead man." Removing a golden eagle button from his uniform, my cousin Harvey placed it in the palm of my hand. Then Harvey shook hands with my dad for a second time. Before entering the car of his driver, he said, " I've got several more people to visit. Wish I could stay longer. If I don't see you again, Rum, I'll see you in heaven." We were all joyful that Uncle Harvey Hubbard returned alive following the victory in Europe. Uncle Harvey deceased in a United States veteran's hospital in Marion, Illinois during the 1990's. He was never the same person, but nonetheless, he had fought couragously for his country and The State Of Kentucky and lived to witness the vast changes occurring in America and on Earth. He loved life, and we all wish that he could have lived longer. Following Dan Kilgore's purchase of Dad's poultry and livestock, the house and five acres of land were offered for sale. Very quickly closing on the Fulks house near the Cumberland River and the city of Eddyville, our possessions were moved to a vacant house a mile from Carie Pinegar Fulks' farm on Jennie Ridge in Trigg County. That would serve as our temporary home until Dad completed six weeks on job training. Rummage Ira Fulks was to travel alone to The State Of Georgia; leaving his wife and five children in Western Kentucky. Six weeks was the length of a probationary period required before permanent appointment as a wildlife refuge aid. Training ground was Piedmont National Wildlife Refuge near Round Oak, Jones County, Georgia. "Rum," I remember that my Grandmother Carie Fulks said: "Ella and your children can move in with me for that long. You're going to Georgia by yourself for that long, and we can get a bed or two in here. Food won't be a problem, and they'll be able to stay warm here, too. That house you're moving into is cold and scary. Nobody has ever been willing to move into it." "No, mama. I can't do that now. You can't place five people in this with you, Avel, and Herb. You all would agitate each other to death." Following six weeks absence, Dad had earned a permanent appointment as an employee in the civil service, but it was a while before he received notice by mail that he had successfully completed a probationary period. Dad had continued to work for a short time at Kentucky Woodlands Wildlife Refuge in Livingston, Lyon, and Trigg Counties. A transfer to Piedmont National Wildlife Refuge had been requested and approved. The letter confirming that appointment was delivered to Carie Fulks' mailbox. Dad's spirits were then elevated in knowledge that he was being offered an opportunity to break the chains of past poverty and insecurity. That's a goal for most Americans. The government takes care of its employees and their families; offering all kinds of advantages and benefits. Among recessed memories as a four year old child are how cold was the house into which we had moved. Uninsulated with high ceilings, lighted at night by kerosene lamp, and heated with an iron stove that would become red hot from either coal or wood, surprises and hardships awaited the Fulks family upon our choice of that old house as a place to live- even upon our first entry. "I saw him again!" I'd hear my mother, Ella, proclaim. "He is really here. Of whom she was speaking, I cannot recall, but the face was one she recognized. As a child, I also observed that apparition. One of those just around a corner figures who can make himself visible where help is needed. For me, a four year old boy, I harbor recurring memories of experiencing cold, hunger, and fear from that time in the lives of the Rummage Ira Fulks family. Was the time February, 1945? It might have been. But we were into an extremely difficult and cruel episode during the lives and times of Rummage Ira and Ella Belle Fulks. For I, his son, my dad's long absence created a kind of nightmare episode. It was a dreadful experience for a four-year old to find that ones father is absent from the household. Did Daddy die and they're not telling me? He's not coming home. I don't hear his voice. Where is he? Missing for six weeks training and at Piedmont National Wildlife Refuge near Round Oak, Georgia was my dad, Rummage Ira Fulks. Upon returning from Georgia, he continued his work at "Kentucky Woodlands Wildlife Refuge" for just a brief period. The true sense of time is somehow lost within my sixty-eight year old mind. 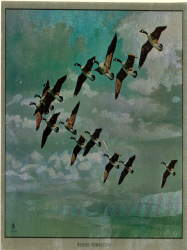 At some time within that threshold, my dad received word, by mail, of his permanent appointment into the civil service and action on his request to be transferred to "Piedmont National Wildlife Refuge" in Georgia. A sister shared with me that we moved from Kentucky to Georgia in February, l945. A moving van for our families meager belongings caused embarrassment for some family members. There were no expensive furnishings, and Dad was ashamed for the men driving the van line to see how little we owned. "We've moved a lot of people with little or nothing of value. We don't care as long as we're paid," said one of the drivers. Early in the morning of the next day, the dog and the cat, Rummage and Ella, Euphama, Dorcas and Betty Jean, Alice Faye and I all got into my dad's 1939 Cheverolet Coupe. Off Dad drove for the first stop of a day that would change our lives forever; to the farmhome of Grandmother Carie Fulks, Aunt Avel, and Uncle Herbert. That was a breakfast stop and my dad's last feast on sugar cured ham for quite some time. (We all enjoyed the same meal as described in Route 2,Golden Pond,Kentucky)That was Grandmother Carie's special breakfast needed for an active day on a Kentucky farm. Enduring a sorrowful departure, it was a solemn occasion for all of us. None of Rummage Fulks' children had ever been far from their friends and relatives. Our departure was an especially tearful occasion for my grandmother, Carie Dell Pinegar Fulks.
" I hate for you to leave here Rum." Grandmother said: "With you and Seamer both gone, I don't know what we'll do. I know that life will be better for you and for your family. We'll manage someway. We always have." "Don't worry, Mama." Rum replied. "I'll send you money when I am able, and if you need anything badly, I can get back in ten hours. Five hundred miles is not that far. We'll write too. Avel, you and Herb be sure to behave yourself and help Mama out when she needs it." The heads of Herbert and Avel nodded in acknowledgement, and the Rummage Ira Fulks family soon disappeared East down a winding, gravel road. They were not to meet again until the Summer of 1945- Rum's thirty days annual leave. Eager anticipation of that which is unknown are probably the words one would have used to describe the feeling of my four older sisters and my parents. Having many acquaintances and friends remaining in Western Kentucky, all were abandoning a familiar land and its creatures that had shared the beautiful landscape of Western Kentucky. As a four-year-old, little did moving to Georgia affect me. Never having traveled beyond the counties of Trigg and Lyon there in Kentucky, I had developed little concept of time and distance. Having been taught to invision the Earth as round and not too large, I recall questioning my parents and sisters as to:"How soon will we be there?" That drew the same response from all: "I wish you would shutup!" Following The Cumberland River Road and turning left onto a paved highway leading to Cadiz, my dad was confident in his ability to reach our new home in Georgia and in his automobile. At thirty-two years of age, he displayed the stamina and emotional stability to control most life situations. As his only son, I've never been quite as confident, stable, or as determined. Where HW 41A began exactly lies deeply into the recesses of my memory bank. We were facing a twelve hour journey by automobile from Kentucky to a wildlife refuge in The State Of Georgia; along a popular tourist and truck route. For me to recall a significant amount of conversation and experience along the way is a task too difficult to fill for one who was a four year old child. Now at sixty-eight, many pieces of that puzzle are missing. But one thing I well remember is that my four sisters conversed excessively, and the conversations occurring between Mother and Daddy was soft and confident. I looked and listened as a tiny creature that understood very little of anything. "Burma Shave" and "Uncle Sam Wants You"
Tennessee farmer using horse drawn tiller.. an older gentleman dressed in his very best clothing.. His farm tilling; perhaps a hundred acres is nearly completed.. He displays an attitude suggesting pride, confidence and love of farming. Most small towns in Tennessee and Georgia required that traffic drive around a center quare and re-enter Route 41A. A few civil war veterans are living and many are Grandsons of those who were Confederate soldiers. (The last civil war soldier deceased in 1959.) Neatly dressed and chewing tobacco, some were antagonized by license plates from other states.. Dad was fearful of stopping in those towns to buy gas. An amazing descent down the tallest peak.. incredible Chattanooga.. far up a mountain and to our right is Lookout Mountain. "We don't have time for that," said my dad.. He was also concerned that the engine might overheat or that his brakes might fail during our descent. Finally Atlanta..Just two hours to our new life at "Five Points-Fire Tower Road." *For that 528 miles from Kentucky to Piedmont National Wildlife Refuge in Georgia, there are few recessed memories for this writer.. I can recall very little conversation. It was February 1945. Having exited the state of Kentucky by 8:00 A.M., the long ordeal was finally completed. Pulling into the driveway at "Five Points-Firetower Road," we had finally arrived at our destination- our home in Georgia. Waiting for our arrival at Wayside had been the moving van and its crew. Then that huge van, containing our meager belongings, followed the Fulks to our house on Piedmont National Wildlife Refuge. Those movers did not seem to have been disturbed by their loss of time. "We've enjoyed seeing the country," one of them said. "I'd trade places with you if I could. There's too many people where I live. Looks like a nice place to raise kids; plenty of room." Come had a chance for a new and better life for the Fulks family- a house with electricity and a bus for transporting children to school. Several other things were different, and for quite some time, we all felt strangely out of place. The Earth could be sensed as a different planet- almost. But a few pieces of better life began to come together. Before long we would meet Mr. Raymond J. Fleetwood, the Afro-Americans, and many other sincere and real-life people in Jones County, Georgia. They were not that different from Western Kentuckians, and many pre-conceptions can disappear after a time. It is possible for people to leave their native habitat and adjust. That was proven by Rummage Ira and Ella Belle Fulks. **Sequels to this story are:(1) Five Points, Firetower Road:The People And Coincidence;(2) Route 2, Golden Pond, Kentucky;(3 The Journey To Chase Prairie;(4) Hurricane On Chesser Island;(5) My grandfather, Mattie Mandard Fulks;(6) Others related to Fulks Family History.